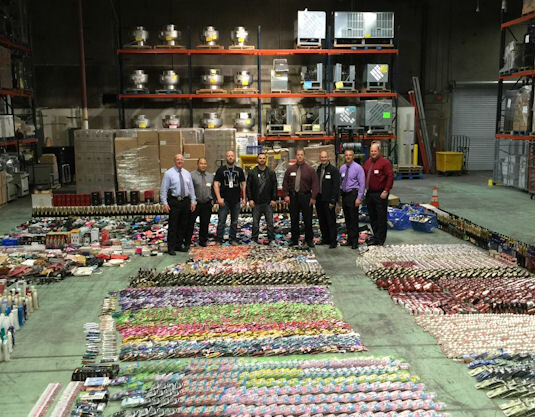 In February 2015, based on information from multiple confidential informants, Kroger ORC team in their Ralph's Division (Los Angeles) began investigating an interstate fencing operation involving two suspects in Los Angeles that were buying large amounts of stolen product from multiple boosters in the Los Angeles area. The fences were transporting the stolen product from Los Angeles to Las Vegas, Nevada, for re-sale. Kroger ORC team was partnered with the Torrance Police Department, California. The Torrance area had multiple retailers that had been victimized by various boosters who were selling the product to these fences. Subsequent to conducting numerous reverse buys with the fences, on May 21, 2015, Torrance detectives, in conjunction with the Kroger ORC team, executed search warrants at four separate locations in the Los Angeles area which lead to the seizure of approximately $300,000 in stolen product from 13 different retailers. Approximately $200,000 in property belonged to Kroger's Ralph's Division. Now that the ORC investigation has been adjudicated, approximately $100,000 in recovered stolen property that has been identified belonging to other retailers will be able to be returned to those retailers. The attached photo depicts the recovery property, the Torrance detectives and Kroger ORC team. This was an excellent example of the retail/law enforcement partnership and what can be accomplished working together to combat ORC. Thank you Denny Dansak, Sr. Corporate Manager, ORC, The Kroger Company for this ORC submission!